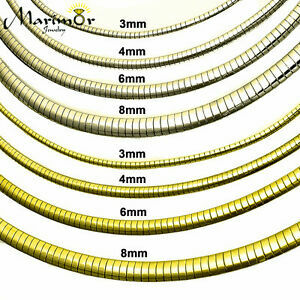 Chain Width: 3mm, 4mm, 6mm or 8mm. You can choose either 4mm 6mm wide or 8mm wide, in Silver or Gold Tone. Color: Gold or Silver Tone. Stainless Steel is hypoallergenic and does not cause allergy. Chain Style: High Polished. Er zijn 824 objecten beschikbaar. Voer een getal in dat minder is dan of gelijk is aan 824. Directe betaling van US $11,25 is vereist. Customer satisfaction is our top priority! If you are unsatisfied with your purchase, you may return or exchange your item within 30 days of receiving merchandise. Item must be returned in original new condition. Shipping cost paid at the time of purchase is non-refundable. Free Pre-paid Return Shipping labels on all USA orders. EXCHANGE SHIPPING COST: USA address $3.00 exchange fee (to cover cost of postage). International address $6.00 exchange fee (to cover cost of postage).